Transforming Diverse Teams: Can a white guy talk with authority on diversity? Can a white guy talk with authority on diversity? 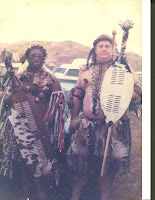 Zulu Chief Bhengu, and I. This is in answer to the above question - posted on LinkedIn. Brian V Moore • Human diversity includes people like myself. I am what you would call white, a member of an African tribe, descendant of Irish, Scottish, Welsh, English and South African forebears, born in Zambia to a Roman Catholic family, resident in South Africa, my wife is a Hindu South African of Indian descent, I speak a number of African languages, Afrikaans and English, greet in over 70 languages, have worked in the USA, UK, Hong Kong and in numerous parts of Africa. My diversity experience comes from living amongst and experiencing people, traditions, cultures, religions and I have worked as a peacemaker in rural African communities. 1) How dare I not share my growth and lessons with others who have not had my experiences. 2) How strange it is that we, as diversity specialists, can judge people by colour. A Zulu (African tribe in South Africa) say clearly in this proverb. "Uhlubu’ dlube ‘khasini" Literally - "A bean is revealed when you open the shell." We cannot know a person by their external appearance. We can only learn about them through either our own experiences of them - or that of others whom they have impacted. Of course any focused and experienced person can speak with authority on diversity. My wife and I have touched 10s of thousands of lives through our work. Let the catalysts of change do their work without judgement!